Just a little note today, to let you know about my end of year teaching schedule. I will be teaching the Gilded Christmas Box, one of my favorite projects to date, at three stores across the US . If you live close to one of these stores, feel free to call to find out more information about this and other classes! Oh how I wish I lived close to one of these stores!!! This Christmas box is just fantastic!! LOVE IT! I can't believe I am going to miss this class...bummer! Love this project...so awesome! Beautiful Christmas Box! How I wish you were coming to PA! Will you give instruction after the class is over? I am sorry Jackie, there is no plan to do a tutorial on the blog for now. If you are interested in a kit, please contact the closest store, I am sure they would love to send you one! What a gorgeous project! I wish you were teaching on the East Coast. This looks like an amazing class. wish I lived so much closer than I do, as I'd love for this kit to be made by me; TFS! OH MY GOODNESS! You are REALLY coming to The Doodle?! And I'm not dead yet!! THREE years of begging and pleading have paid off! Woot! I will see you in December! can you see me happy dantcing?! Cuz I am!! pam, I will not be doing a tutorial on the blog for this one. If by chance you are interested in buying a kit you can contact one of the stores. I am sure they would be happy to send one out to you! Very pretty Paula! If I were anywhere near any of those places I would SO be in your class! You are right I am teaching at Paper Tales on the 16th on Nov. That was my fault - I typed the wrong date for Paper Tales when I did the blog post. I have corrected it here on the blog, but of course the feed had been sent out. Sorry about the confusion!! Oh, I can't believe that I live close to the Texas store! I am going to call them first thing in the morning and hope there is a spot left :) Your Gilded Christmas Box is gorgeous! I look forward to meeting you Laura! Paula...what I have to do to get you to the NYC area???? I just LOVE your work. So envious of those who can reach out and touch you! Thanks Ro! Appreciate the complement - not sure when I will make it to your area but thanks for letting me know you would like me to come that way! What an amazing project - I just love it! Hi Paula :) I've recently discovered you by way of Instagram and have been reading your blog. So much inspiration goodness here!! 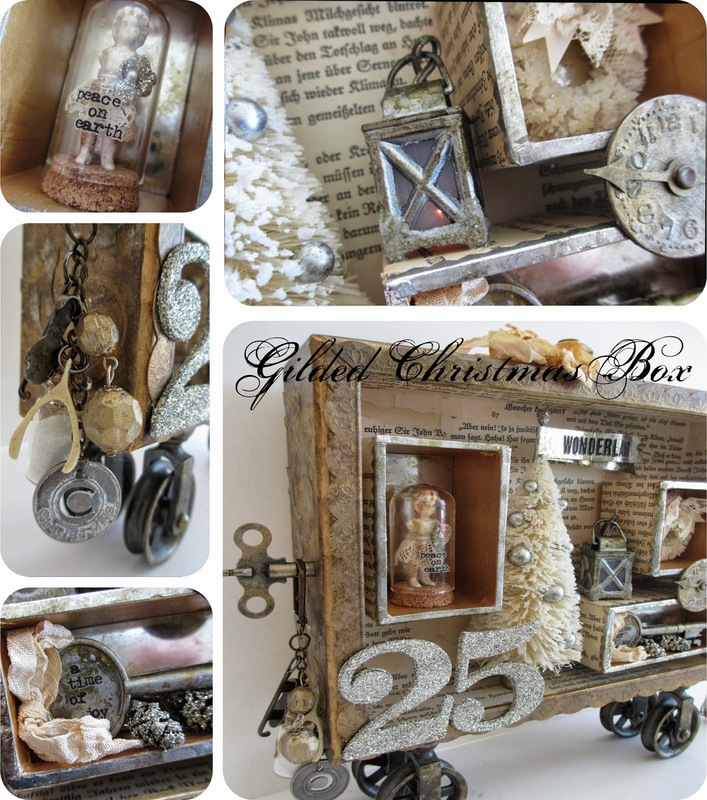 I LOVE the gilded Christmas box and would like to know if you will be offering a class this year on it? Or a tutorial for purchase on etsy? (I've checked there before asking here) I'm in Northern California (Redding) and am planning to participate in a workshop ithis November...can't wait for the details!! Hoping to hear from you.